Ultimately, it's understanding and designing for users' goals (what they need to accomplish) that is key. Their tasks (what they do) are how they accomplish those goals with their existing set of tools. 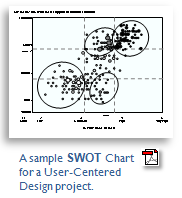 References to some of my usage analysis work at IBM in the 1990's. Microsoft also uses this method for their Office products . Today, I examine Internet usage-logs to provide insights into how the site is -- and isn't -- being used. A field study involves passive observation of users' activities in the study environment. A Contextual Inquiry is hybrid field study / interview technique that keeps the focus on your project's needs. My Ph.D. user-research was awarded the 1990 Alphonse Chapanis Award (Best Student Paper) by the Human Factors and Ergonomics Society. Far too often, important application design decisions are based on conceptions of users and their tasks that are imagined by different members of your project team but have little basis in reality. The result? Users struggle with an application bloated with unnecessary features, their real needs (requirements) go unfulfilled, and they are faced with awkward, inefficient, and confusing methods to accomplish their goals with your application. Application development is expensive. Rework required from the guesses and mistakes about users and their needs adds significant time and cost. You need the right information for application design to ensure that your project starts on the right path -- and stays there. Understanding your applications users -- their various capabilities, expectations, wants, needs, and goals -- is the foundation for creating a successful application. I am a Ph.D. Human Factors psychologist, and former professor of research design and statistics: I know the academic side of research methodology. But with 30 years of real experience conducting user-research for technology projects, I keep a sharp focus on getting the information your project can actually use. And as a user-interface designer, I know what information your team really needs to develop a usable application. Identifying and prioritizing a good set of technical-, business-, and end-user requirements is the foundation of a successful project. It is well known that misunderstood or missing requirements are the primary reason for cost overruns in software projects. Dont waste time and money on developing features that your target market won't use, or don't work the way they should. I have significant experience in identifying and prioritizing user-requirements directly from representative samples of users from your target markets. Identifying requirements - I use a method, a combination of methods, that will best suit your own project: focus-groups, contextual inquiry, online surveys, task analysis, and usability reviews. And as an experienced user-interface designer I know how to document requirements in a way that can be used directly in user-interface design. Prioritizing requirements - As a statistics professor for many years, I can quickly employ the most insightful measurement and statistical techniques to provide unmatched quality in prioritizing user-requirements for your project. If your project has little time or budget for comprehensive work with end-users, I can do my best to gather and prioritize requirements from your business's subject-matter experts, business analysts, "super-users", or product trainers. Given my focus on business applications, much of the work I do involves deriving business-requirements from business stakeholders at your company. Most business requirements have direct implications for end-users and for your application's user-interface design. Your design team needs a good understanding of the individual tasks users need to do to achieve their goals (i.e., to get their work done) so they can design an application that will make it easier to accomplish those goals. Knowing your target end-users' current set of tasks is important because they embody important details of various systems and business processes that may participate in the future solution provided by your new application. A task analysis identifies all the various tasks that users perform (including conditional tasks) as they work to accomplish their specific "goal". A task analysis may identify several error-prone, delay-prone, and time-consuming tasks in the user's the current ways of accomplishing their goals. The analysis finds opportunities for technology to streamline inefficient processes by reducing the number of individual tasks involved. In typical business environments, a particular goal (e.g., "complete a transaction") involves a series of tasks that must be completed by a number of users, usually with a number of different systems. This is the current process workflow. "Tasks" may involve things like: a user reading their e-mail to locate requests from other groups in the company, locating clients' account data on a legacy system, logging into a transaction system to place an order, printing an approval form to route a request for approval, await the response, and then post order information on another system. Ultimately, a usable application will enable users to accomplish their goals more easily, more quickly, with fewer steps and fewer errors, and they will be more satisfied with the experience (in some cases, the application may also strive to strengthen and deepen your company's relationship with the user). Determine the goals and scope of the development project. Identify an initial list of tasks from Subject Matter Experts (SMEs), process specialists, and process documentation. If necessary, validate the task list and gather additional task data from actual end-users using contextual inquiry, focus groups, and user surveys. Create a process-flow diagram that depicts overall task-flow (or "workflow"). 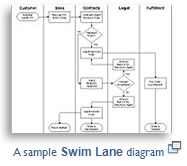 Swim lanes are a useful format for software projects. Identify tasks / steps in the current process flow that could be improved, streamlined, or eliminated (automated) by user-centered application design. Consider the process flow with modified SWOT analysis to prioritize which tasks to focus on in redesign. A task-analysis is an important input for your application's user-interface designer when designing a usable application. What event(s) triggers the user to start their work? Who is responsible for completing this step (the Actor)? How often do your have to do this task? How much of your job is occupied by doing this task? How important is this task relative to your other work? Are there errors that typically happen during this step? Is there anyone else your collaborate with on your task? What do they get and what systems do your use to collaborate? Are there particular problems, annoyances, errors that occur while doing this task. Considering everything, how satisfied are your with completing this task? Output goes to where; to who? How do they receive it (which system)? Does it need to be acknowledged to the originator or other users? In which task-steps are delays, inefficiencies, errors, stress occurring in the workflow? Does workflow status need to be monitored? By who? A SWOT analysis provides an effective way to prioritize your application's support for user-task requirements in a competitive situation. Nearly every new application has a competitor, and that "competitor" is often an awkward and inefficient set of procedures and applications that users are currently using to get their work done. The "competitor" may also be the current version of your own application. Often, users are familiar enough with their current ways of doing things that any change must clearly address their needs head-on. The modified SWOT analysis begins with a comprehensive candidate set of of user- tasks/requirements, identified through business analysis, task-analysis and earlier user-research. Then, a representative sample of your target end-users rate both the importance of these various tasks in their work, and their satisfaction with their current methods of doing those tasks. The Strengths of your application's competitor: for your own application to be competitive it must at least match its competitor on those tasks that users say are important and are well supported by the competitor. Your application also has the Opportunity to beat its competitor by delivering a better solution for those tasks that users say are important but are poorly supported by the competitor. There will also be a number of user tasks/requirements of low-importance relative to others. Your project will be better off by setting those aside and instead, focus its resources on the strengths and weaknesses of your competitor application. In Contextual Inquiry research I interview your application's target end-users about their work, directly in their work environment, to understand the context in which they will use your application and to identify requirements for a useful and usable application. These studies are especially useful when your application will provide an online solution for a "hands-on" paper process, or provide an integrated replacement of a number of disparate online systems. The importance of this understanding is obvious for specialized workplaces like the shop-floor, but even office environments provide clues that reveal requirements for an interactive solution that would not otherwise be identified. These are often important details that are so much part of the user's everyday work that they wouldn't think of mentioning it in a discussion. A typical contextual inquiry project will involve 12 to 24 sessions, lasting about 1.5 to 2 hours each. Typically, the contextual inquiry session begins with the user-interviewee at their daily work space (usually, their desk) and then simply stepping-through and describing for me what they do when they come in for a typical day at work: what they check first with their morning coffee and what they do with what "system" (telephone, e-mail, walk down the hall to see a colleague, schedule a meeting, check a custom business system) when they need to act on something. Throughout the target-user's recreation of their "day at work" I hear about their motivations, priorities and problems, I see the data they need to work with, the various people, systems and procedures they deal with, and how they pass information between them. I refer to my own checklist of issues to ensure that all the relevant points for my client's design project have been covered during the sessions. Under a non-disclosure agreement (NDA), I usually audio-record the sessions, take brief notes, and collect screen-shots and print-outs of significant work artifacts and photographs of the work environment. I review the data and extract the key observations from that session for input to detailed analysis. Affinity grouping - There will be hundreds of key observations collected during the CI sessions. To derive the key findings, I tag each observation with values that classify it according to the specific topics it relates to (e.g., "Analyst complains about incomplete e-mail requests" may have been identified in 12 of 16 CI sessions). The individual observations are grouped together according to their various classification-tags so that major themes can be identified. Unlike the imagined nirvana of today's electronic-office, real users do things like prioritize their work by how high the stack of couriered-packages piles up on their desk, mark important information with Post-It notes, and struggle with antiquated legacy hardware, software, and operating procedures. A focus group is a generic term that refers to a number of appropriate individuals (i.e., your application's target end-users) gathered together to participate in a moderated discussion of a particular topic. A well run focus group can provide insightful feedback on a variety of products and services from consumers. The key for the effective use of focus groups in a design project is to know why and when to use focus groups, and when other methods would be more effective at gathering the necessary knowledge. The main advantage of focus groups is that several (typically 8-12) individuals provide their input to the topic in a short-time (typically 2-3 hours), and the real-time interaction among the various attendees and the moderator can lead to important insights that may not have otherwise be identified. The main disadvantage is that "talk is cheap": it is easy to collect questionable -- and possibly misleading -- information that will be used to inform the design of interactive software applications. I have designed and conducted dozens of focus groups for design projects, each tailored to the specific requirements of the particular project. As a user-interface designer, I know what information is needed to make important decisions about user-interface design. As a former psychology professor in research design and statistics I know the most efficient and effective methods to collect quality data for your own project. A project team's appreciation that there is more than just one type of "user" of their application is a necessary step in building a usable application. There are always differences in users needs, skills, and motivations for using the application, and these have major implications for successful application design. User research will discover a myriad of details about various types of users. But that wealth information can be overwhelming for the user-interface designer and the project team as a whole. Designing an application for "users" is difficult when there are many disjointed details about various target-markets and end-users to consider in every design decision. Personas -- descriptions of fictitious people complete with pictures, names, jobs, knowledge-levels, and personalities -- provide concrete examples of your application's users to which everyone on the project team can readily relate. This shared understanding of the different types of users will provide the focus that your team needs to work together, quickly and effectively, to make the best design decisions for your application's end-users. A design project will identify perhaps 3 or 4 primary personas -- the key users that will drive your application design decisions -- and a number of secondary personas who should also be considered. If research data are not available, I develop your application's personas from the knowledge and assumptions of various stakeholders on your project team. A design walkthrough is a focus-group that uses a methodology to gather feedback from a group of users regarding the design of your current release, a competitor product, a best-of-class solution, a prototype, or design concepts before an interactive prototype that will permit hands-on usability testing is available. In the session, I "walk through" each step of key user-tasks (i.e., usage scenarios) using a depiction of the application (e.g., screen-shots) in a way that the representative users can, as close as possible, "experience" the application as if they were using it in the real-world. The walkthough participants provide feedback about the application based on their own prior experiences doing those same tasks in the real-world. The method also uncovers important information about the tasks that users perform using their current toolset. Both qualitative and quantitative feedback is gathered during the walkthrough on both an individual- and group-basis to provide for a thorough analysis. Satisfaction and user-experience ratings and comments are collected from a dozen or more users in a single session. The method serves to provide the hands-on task-oriented context that the group of users can relate to. Their comments and questions provides a much richer set of data than a typical interview, survey, or focus-group. Real-time group walkthrough sessions can be conducted in-person in a meeting room, or can be run over the Internet using participants located around the globe. Today, it's easy to conduct a survey to collect end-user information, satisfaction ratings, and other feedback about your application or Internet site. Everyone on the web has been requested to provide site-feedback by a pop-up / intercept survey, by an e-mailed link to a survey, by a link to a feedback survey embedded in the site, or have been asked to provide immediate feedback using a field embedded directly in the application. Anyone can write a questionnaire and post it on Survey Monkey or outsource the hassles of data collection and then analyze the responses and draw conclusions. But its also easy to collect survey data that is questionable or of little value for assessing and improving your application's design where it matters. And often a survey is used to provide insight about design when other research methods would be far more effective. When a survey would be an effective research method for your project, I write content and develop and execute a survey strategy that will provide high-quality data that can be used to drive the right design decisions. To do this requires an understanding of your end-users, their goals, your business goals for the application, and your application itself. But to do it right also some serious knowledge of psychometrics, questionnaire and survey design, and statistical analysis. 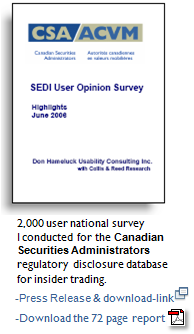 Since 1995 I have conducted online user-surveys for more than a dozen projects, including small surveys in ongoing design projects for internal applications and large national / global surveys for technology applications in database technology, online stock trading, and stock-market regulation/disclosure. My background as a Professor in research design and statistics helps ensure the quality of your results and interpretation of the data. And as a user-interface designer, I know which questions will be most useful for finding and solving usability problems. Much of the value of Internet technology is the access it provides to a nearly endless amount of information. But that information might as well not be on your own Internet/Intranet site if its users give up before they can find it. Content is king, and usability is its servant. But in order for information to be found it needs to be organized and labeled in ways that makes sense to its various types of end-users (i.e., its Personas). That information taxonomy determines your site's primary and secondary navigation-menu structure, which is the principal method by which users interact with your site to locate what they need. Your site's information taxonomy , coupled with its integration to your site's search engine and personalization strategy , are all central to providing a usable user experience. These are all facets of your site's information architecture. While a designer or Information Architect can make intelligent guesses as how to organize information, they are business insiders who are far closer to your site's content inventory than real end-users. They know what information is actually in the inventory and they know the businesses' terminology, whereas the user needs to discover what is there, and will approach the information-seeking task using their own vocabulary. The best way to understand users' perspectives of an information taxonomy is to use the cart-sort method. Statistical analysis of the data aggregated over will uncover groupings of items that are meaningful over the group of users in general, and also for different user segments. This information is used to help identify an information hierarchy that would be meaningful to your site visitors. 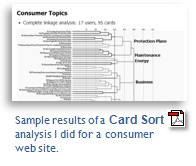 The card-sort method can also be used to organize functions of software applications for findability in your application's menu structure. Site server-logs, click-streams, and instrumented user-interfaces (UIs) provide rich archival data of application usage. These data-sets hold enormous potential for understanding the behavior of visitors using your site and for improving your sites effectiveness. For example, research that studied a large content environment found that in a three month period, over 90% of available content files were never accessed, and two-thirds of the remaining 10% were accessed only once. But a dozen content files were opened 100,000 times or more. The implications for user-interface design are obvious. Anyone with a website can collect usage data, but anyone who has tried knows it is difficult to use them to evaluate and improve the usability of your site (not just its marketing campaigns) or your application. Web Analytics / e-business intelligence solutions are embraced by all successful pure e-businesses, but still, many large strategic web properties do little with this information. I specialize in turning usage data into real information for improving site / application design. When analyzed appropriately, usage data can be powerful in identifying where your design isn't working as you want, but it cannot directly answer why it isn't working. I examine application usage data to determine which research, testing, and design will most benefit your application and its end-users. I have considerable experience in both academic research and IT projects working with usage data from desktop and Internet applications. I use these data to understand which parts of the application and which navigation sequences are most popular, which are being underutilized and show that the application is not being used "effectively", and which user-interface events point directly to user problems. My strong background in statistical analysis and data-mining helps me to uncover telling trends from huge data-logs that may otherwise be missed. As marketplaces become globalized, many applications must be easy to use despite regional variations in language, business-processes, and regulatory environments of its user base. To address this problem, I will develop a strategy to engage the necessary global audience in your user research. This can involve Internet collaboration technology (e.g., GoToMeeting, WebEx, and others) where I can reach-out and gather data in real-time from users located around the world. When necessary I travel to locations in North America and Europe to collect data by direct involvement with the appropriate set of users. I can also outsource research to local expertise and then coordinate global data collection and unify data analysis to ensure the findings are of immediate use to your project team. The methods and analytic techniques listed above are just a sampling of the most well-known procedures I've used many times on usability-focussed projects since 1981. But there are many other methods that can be tailored to provide the key insights you need for your own project. I have a Ph.D. background in fundamental human-research methods and statistics. I apply my knowledge and experience in research and IT projects to provide the most timely, useful, accurate, and insightful understanding of users and their work for your own project needs. © 2001 Don Hameluck Usability Consulting Inc.
.. is like going camping without "appreciating" the realities of mosquitoes. 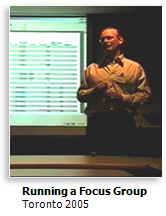 I have conducted dozens of focus groups for design projects. I make sure that focus groups give more than just "lip-service" to design and usability issues. Supporting the right set of requirements will help make your application useful. But users will still have problems with your application if it is not usable. (But don't worry: I use the methods that work best in real projects).